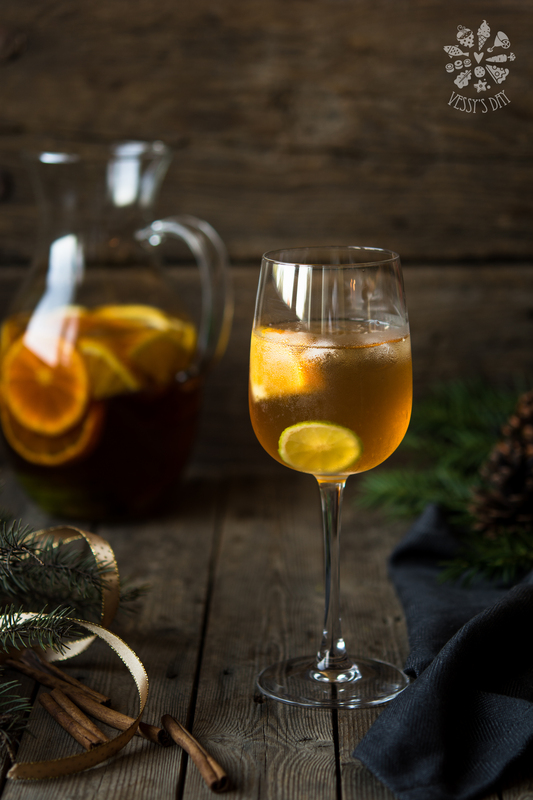 This year, we will be welcoming the holidays with a pitcher of sangria – it is quick, easy, delicious and super flavorful. Oh boy, when I think of all these Christmas flavors gathered in one big pitcher, topped with a few ice cubes and a couple of mint leaves, I wish Christmas lasts for at least a month, so I can make this recipe with different fruits and wine every day. Well, I don’t intend to sound like a drunk, I am just saying that this is probably one of the greatest girly drinks ever. Think about it – there is like 300 ml. of white wine in one whole big pitcher, you can’t ever have too much of it, cause it’s light, light, light, just for girls. Add all ingredients (except the ice and mint) in a large pitcher. Stir and put in the fridge for an hour. Before serving add ice and arrange a few mint leaves in each glass. Adjust the taste according to your preferences – add more or less honey, wine and iced tea. 1) use red wine instead of white wine if you like. 2) add extra fruits – apples, pineapple, berries and etc., whatever you like and have on hand.